Research Interests: human medical genetics, population genetics, genetics of comorbidity of common diseases. - EC, FP-6, GABRIEL “A multidisciplinary study to identify the genetic and environmental causes of asthma in the European Community”, contract LSHB-CT-2006-018996, 2007-2010. - EC, FP7, HEALTH-2007-2.2.1-10, CHERISH “Improving diagnoses of mental retardation in children in Central Eastern Europe and Central Asia through genetic characterisation and bioinformatics/-statistics”, project 223692, 2009-2012. - EC, FP7-HEALTH, ADAMS “Genomic variations underlying common behavior diseases and cognition trait in human populations”, project 242257, 2009-2012. - The Russian Foundation for Basic Research, “Methylation status of cyclin-dependent kinase inhibitor genes in atherogenesis”, 10-04-00674, 2010-2012. - Federal Target Program “Research and development for priority directions of science and technology complex of Russia for 2007-2013”, “Coevolution of human genome and phenotype: genetic diversity of populations and phenotypic variability of syntropic signs”, contract № 02.740.11.0284, 2009-2011. - Federal Target Programme “Scientific and Scientific-Pedagogical Personnel of the Innovative Russia” for 2009-2013, “The study of the pleiotropic genetic effects in different functional states of the human organism”, contract P-1288, 2009-2011. - Federal Target Programme “Scientific and Scientific-Pedagogical Personnel of the Innovative Russia” for 2009-2013, “Design of oligonucleotide biosensors for genotyping syntropic genes of cardiovascular continuum”, contract P-259, 2009-2011. - Federal Target Programme “Scientific and Scientific-Pedagogical Personnel of the Innovative Russia” for 2009-2013, “Phenomenon of paradominant inheritance of complex diseases”, contract 8062, 2012-2013. - President Grants for Government Support of the Leading Scientific Schools of the Russian Federation, “Epimutations, paradominant inheritance and atherogenesis”, contract NSh-5096.2014.4, 2014-2015. - Russian Science Foundation, “Postzygotic variability of nuclear and mitochondrial genome during atherosclerotic vascular lesions in men”, contract 14-15-00305, 2014-2016. M.D. (i.e. Candidate of Medical Sciences). Thesis: Clinical, genealogical and biochemical studies of susceptibility to atherosclerosis and coronary heart disease – 1977. 1. Freidin M.B., OgorodovaL.M., Puzyrev V.P. Pathogenetics of allergic diseases. – Novosibirsk: Publishing House “Siberian Branch of Russian Academy of Sciences”, 2015. 149 рр. 2. 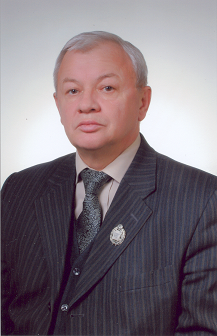 Nazarenko L.P., Puzyrev V.P. Oxford monographs on medical genetics “Genomics and heals in the developing world” Chapter 112. “Hereditary diseases among the Yakuts”. / Ed. By D. Kumar. Oxford University Press, Inc. Oxford, New York. 2012. - Р. 1323-1354. 3. Bukreeva E.B., Seitova G.N., Puzyrev V.P. Inflammation in COPD: Role of endogenous and exogenous factors. - Tomsk: SSMU 2011. – 225pp. 4. Puzyrev V.P., Freidin M.B., Kucher A.N. Genetic diversity of population and human diseases. Publishing House “Pechatnaya Manufaktura”, 2007. 320 pp. 5. Nazarenko S.A., Popova N.A., Nazarenko L.P., Puzyrev V.P. Nuclear and chemical production and genetic health. Tomsk: Print Manufactory, 2004. 272 pp. 6. Kucher A.N., Ondar E.A., Stepanov V.A., Odinokova O.N., Golubenko M.V., Freidin M.B., Kosyankova T.V., Puzyrev V.P. Tuvinians: genes, demography and health. Tomsk: Publishing House “Pechatnaya Manufaktura”, 2003. 232 pp. 7. Puzyrev V.P., Nazarenko L.P. Genetic and epidemiological study of hereditary diseases in Western Siberia. Tomsk: STT, 2000.- 192 pp. 9. Puzyrev V.P., Stepanov V.A. Pathological anatomy of the human genome. Novosibirsk: Nauka, 1997. 224 pp. 10. Stepanov V.A., Lemza S.V., Puzyrev V.P. The genetics of lipoprotein metabolism disorders. Tomsk: TSU Publishing House, 1992. 141 pp. 11. Puzyrev V.P. Medical and genetic study of the population of circumpolar regions. Tomsk: TSU Publishing House, 1991. 200 pp. 12. Vasilyev N.V., Puzyrev V.P., Podoplekin V.D., Ruzaev L.N., Abanina T.A., Nazarenko S.A., Lemza S.V., Nazarenko L.P. Complex clinical and genetic study of the indigenous peoples of Western Siberia. Tomsk: TSU Publishing House, 1987. 165 pp. 1. Makeeva O.A., Sleptsov A.A., Kulish E.V., Barbarash O.L., Mazur A.M., Prohorchuk E.B., Chekanov N.N., Stepanov V.A., Puzyrev V.P. Genomic studies of comorbidity of cardiovascular continuum. Acta Naturae. 2015;7(3):67-78. 2. Puzyrev V.P. Genetic Bases of Human Comorbidity. Genetika. 2015. 51(4):491-502. 3. Nazarenko M.S., Markov A.V., Lebedev I.N., Freidin M.B., Sleptcov A.A., Koroleva I.A., Frolov A.V., Popov V.A., Barbarash O.L., Puzyrev V.P. A comparison of genome-wide DNA methylation patterns between different vascular tissues from patients with coronary heart disease. PLoS One. 2015. 10(4):e0122601. 4. Rudko A.A., Garaeva A.F., Bragina E.Y., Babushkina N.P., Kolokolova O.V., Lipaenkova O.N., Puzyrev V.P., Freidin M.B. Mutations in genes underlying atypical familial mycobacteriosis are not found in tuberculosis patients from Siberian populations. Tuberculosis (Edinb). 2015. 95(2):204-207. 5. Saltykova I.V., Ogorodova L.M., Bragina E.Y., Puzyrev V.P., Freidin M.B. Opisthorchis felineus liver fluke invasion is an environmental factor modifying genetic risk of atopic bronchial asthma. Acta Trop. 2014. 139:53-56. 6. Bragina E.Y., Tiys E.S., Freidin M.B., Koneva L.A., Demenkov P.S., Ivanisenko V.A., Kolchanov N.A., Puzyrev V.P. Insights into pathophysiology of dystropy through the analysis of gene networks: an example of bronchial asthma and tuberculosis. Immunogenetics. 2014. 66(7-8):457-465. 7. Scholtens S., Postma D.S., Moffatt M.F., Panasevich S., Granell R., Henderson A.J., Melén E., Nyberg F., Pershagen G., Jarvis D., Ramasamy A., Wjst M., Svanes C., Bouzigon E., Demenais F., Kauffmann F., Siroux V., von Mutius E., Ege M.J., Braun-Fahrländer C., Genuneit J.; GABRIELA study group, Brunekreef B., Smit H.A., Wijga A.H., Kerkhof M., Curjuric .I, Imboden M., Thun G.A., Probst-Hensch N., Freidin M.B., Bragina EIu, Deev I.A., Puzyrev V.P., Daley D, Park J, Becker A, Chan-Yeung M, Kozyrskyj A.L., Pare P., Marenholz I., Lau S., Keil T., Lee Y.A., Kabesch M., Wijmenga C., Franke L., Nolte I.M., Vonk J., Kumar A., Farrall M., Cookson W.O., Strachan D.P., Koppelman G.H., Boezen HM. Novel childhood asthma genes interact with in utero and early-life tobacco smoke exposure. J Allergy Clin Immunol. 2014. 133(3):885-888. 8. Sleptsov A.A., Nazarenko M.S., Lebedev I.N., Skriabin N.A., Frolov A.V., Popov V.A., Barbarash L.S., Puzyrev V.P. Somatic genome variations in vascular tissues and peripheral blood leukocytes in patients with atherosclerosis. Genetika. 2014. 50(8):986-995. 9. Salakhov R.R., Goncharova I.A., Makeeva O.A., Golubenko M.V., Kulish E.V., Kashtalap V.V., Barbarash O.L., Puzyrev V.P. TOMM40 gene polymorphism association with lipid profile. Genetika. 2014. 50(2):222-229. 10. Sokolova E.A., Malkova N.A., Korobko D.S., Rozhdestvenskii A.S., Kakulya A.V., Khanokh E.V., Delov R.A., Platonov F.A., Popova T.Y., Aref' eva E.G., Zagorskaya N.N., Alifirova V.M., Titova M.A., Smagina I.V., El' chaninova S.A., Popovtseva A.V., Puzyrev V.P., Kulakova O.G., Tsareva E.Y., Favorova O.O., Shchur S.G., Lashch N.Y., Popova N.F., Popova E.V, Gusev E.I., Boyko A.N., Aulchenko Y.S., Filipenko M.L. Association of SNPs of CD40 gene with multiple sclerosis in Russians. PLoS One. 2013;8(4):e61032. 11. Melen E.; Granell R.; Kogevinas M.; Strachan D.; Gonzalez J.R.; Wjst M.; Jarvis D.; Ege M.; Braun-Fahrlaender C.; Genuneit J.; Horak E.; Bouzigon E.; Demenais F.; Kauffmann F.; Siroux V.; Michel S.; von Berg A.; Heinzmann A.; Kabesch M.; Probst-Hensch N.M.; Curjuric I.; Imboden M.; Rochat T.; Henderson J.; Sterne J.A.C. ; McArdle W.L. ; Hui J.; James A.L. ; Musk A.W. ; Palmer L.J. ; Becker A.; Kozyrskyj A.L. ; Chan-Young M.; Park J.E. ; Leung A.; Daley D.; Freidin M.B. ; Deev I.A. ; Ogorodova L.M. ; Puzyrev V.P. ; Celedon J.C.; Brehm J.M. ; Cloutier M.M. ; Canino G.; Acosta-Perez E.; Soto-Quiros M.M. ; Avila L.; Bergstrom A.; Magnusson J.; Soderhall C.; Kull I.; Scholtens S. ; Boezen H.M.; Koppelman G.H. ; Wijga A.H.; Marenholz I.; Esparza-Gordillo J.; Lau S.; Lee Y.A. ; Standl M.; Tiesler C.M.T. ; Flexeder C.; Heinrich J.; Myers R.A.; Ober C.; Nicolae D.L. ; Farrall M.; Kumar A.; Moffatt M.F. ; Cookson W.O.C.M. ; Lasky-Su J Genome-wide association study of body mass index in 23000 individuals with and without asthma. Clinical And Experimental Allergy. 2013;43(4):463-474. 12. Freidin M.B., Bragina E.Y., Puzyrev V.P., Saltykova I.V., Deeva E.V., Ogorodova L.M. Effect of additional disease (comorbidity) on association of allergic rhinitis with KCNE4 gene rs12621643 variant. Russian Journal of Genetics. 2013;49(4):473-475. 13. Polovlkova OG, Makeeva OA, Lezhnev AA, Goncharova IA, Kulish EV, Shipulin VM, Puzyrev VP. Expression profile of calcineurin pathway genes in myocardium tissues in relation to ischemic heart remodeling in humans. Mol Biol (Mosk). 2013;47(3):433-440. 14. Goncharova IA. ; Babushkina NP. ; Minaycheva LI. ; Markova VV; Kulish EV; Salakhov RR; Makeeva OA; Puzyrev VP. Prevalence of alleles of polymorphic variants Leu33Pro and Leu66Arg gene ITGB3 among inhabitants of Siberia. Russian journal of genetics. 2013;49(8):877-880. 15. Zheikova TV, Golubenko MV, Buĭkin SV, Botkina OIu, Tsimbaliuk IV, Maksimov VN, Voevoda MI, Puzyrev V.P. Association between 242C>T polymorphism of NADPH oxidase p22phox gene (CYBA) and longevity in Russian population. Genetika. 2013;49(3):410-414. 16. Makeeva OA, Zykov MV, Golubenko MV, Kashtalap VV, Kulish EV, Goncharova IA, Barbarash OL, Puzyrev VP The role of genetic factors in prediction of myocardial infarction complications within one year follow up. Kardiologiya. 2013;53(10):16-23. 17. Nazarenko MS, Markov AV, Lebedev IN, Sleptsov AA, Frolov AV, Barbash OL, Puzyrev VP. DNA methylation profiling of the vascular tissues in the setting of atherosclerosis. Mol Biol (Mosk). 2013;47(3):398-404. 18. Nazarenko MS; Markov AV; Lebedev IN; Sleptsov AA; Koroleva JA; Frolov AV; Barbarash OL; Barbarash LS; Puzirev VP Methylation profile of INK4B-ARF-INK4A locus in atherosclerosis. Genetika. 2013;49(6):783-787. 19. Puzyrev VP, Nazarenko LP, Lebedev IN. Genetic load and orphan diseases in Siberian populations. Bulletin of the Siberian Branch of the Russian Academy of Medical Sciences. 2013; 33(2):54-62. 20. Saltykova IV, Freidin MB, Bragina EY, Ogorodova LM, Puzyrev VP Association of polymorphism rs6737848 in the SOCS5 gene with bronchial asthma. Annals of the Russian Academy of Medical Sciences. 2013; 7:53-56. 21. Kucher AN, Babushkina NP, Buikin SV, Puzyrev VP. Pleiotropic effects of multifactorial disease susceptibility genes. Molecular medicine. 2013;2:13-23. 22. Sokolova E.A., Malkova N.A., Korobko D.S., Rozhdestvenskiĭ A.S., Kakulia A.V., Khanokh E.V., Delov R.A., Platonov F.A., Popova T.E., Aref'eva E.G., Zagorskaia N.N., Alifirova V.M., Titova M.A., Smagina I.V., El'chaninova S.A., Popovtseva A.V., Lichenko Iu.N., Dymova M.A., Vaĭner A.S., P'iankova O.V., Oskorbin I.P., Kechin A.A., Puzyrev V.P., Kulakova O.G., Tsareva E.Iu., Favorova O.O., Shchur S.G., Lashch N.Iu., Popova N.F., Popova E.V., Gusev E.I., Boĭko A.N., Aul'chenko Iu.S., Filipenko M.L. The first results of a combined all-Russian study on clinical genetics of multiple sclerosis. Korsakov Journal of Neurology and Psychiatry. 2013; 113(2):6-9. 23. Rudko AA, Freidin MB, Bragina YeYu, An A, Puzyrev VP Search of tuberculosis susceptibility genes using the results of genome-wide association study of Crohn’s disease. Bulletin of Siberian Medicine. 2013; 12(3):61-68. 24. Nazarenko M.S., Markov A.V., Lebedev I.N., Sleptsov A.A., Frolov A.V., Barbarash O.L., Barbarash L.S., Puzyrev V.P. DNA methylation status of the cell proliferation genes in atherosclerosis. Atherosclerosis. 2013;1:5-13. 25. Saltykova IV, Freydin MB, Ogorodova LM, Puzyrev VP Genetic predisposition to helminthiasis. Russian Journal of Genetics: Applied Research. 2013;11(2):22-33. 26. Trifonova EA, Spiridonova MG, Gabidulina TV, Urnov FD, Puzyrev VP, Stepanov VA. Analysis of the MTHFR gene linkage disequilibrium structure and association of polymorphic gene variants with coronary atherosclerosis. Genetika. 2012;48(10):1207-1220.